At Skiers Lodge Resort Park City, we have a “Week 52” Christmas New Year holiday 2BR week every year, and can also sometimes get obtain 1BR and 2BR winter school vacation and national holiday ski condo vacation rentals at this resort. 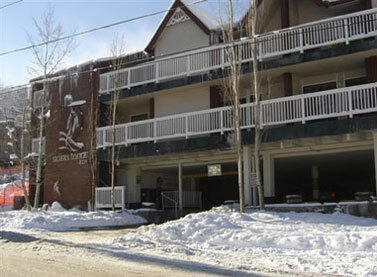 Please click here to see current availability, prices, payment options, photos and other information regarding Skiers Lodge Resort Park City condo vacation rentals. The one bedroom one bathroom units cover about 700 square feet, while the two bedroom two bathroom condos measure about 1000 square feet. These comfy condos are fully furnished for your enjoyment. All lodging accommodations provide a full kitchen, jetted tub in master bath (2 bedroom only), queen beds with upgraded mattresses, living room, sofabed, TV in living room & bedroom, dvd/vcr player, fireplace & lodge provides firewood. Onsite amenities include free covered parking, complimentary washers & dryers (no cost), ski storage lockers, free continental breakfast Monday mornings, clubhouse with library, pool table, sitting area, and hot tub. Guests can also partake of Sweetwater’s exercise room, game room, & pool & hot tub located across the street.